Tom Sykes headed into the first race of the WSBK championship at Spain comfortable in the knowledge that if he managed to make it to the podium, he'd win the 2013 World Superbike Championship. This, irrespective of where nearest title rival, Eugene Laverty, would finish. Laverty started Race 1 from pole, and went on to take victory. Sykes, for his part, moved into second on the grid at race start, although over the course of the race he got bumped down into third place by Marco Melandri. That didn't matter too much when it came to his title hopes, though. He'd finished on the podium, and the 2013 WSBK championship was his. It was a far cry from the disappointment he faced at the end of the 2012 season, missing out on the title by a single point. It was Syke's first WSBK championship title and Kawasaki's first title in 20 years. Meanwhile, Sykes' title rival, Laverty took victory in the second race at Jerez too, winning in a dramatic fashion when he took the lead from Marco Melandri on the last corner. This still doesn't do away with the huge question mark that hangs over Laverty's career at the moment. Speculation is rife as to whether or not he will continue in the WSBK series next year, or whether he will move to the Pramac Ducati team for the 2014 season of MotoGP. Sykes, who went into the final round of the championship with a 37 point advantage over Laverty has commented that he is ecstatic about his victory, even admitting that he allowed himself to dream of the title a little after the WSBK round at Magny Cours. 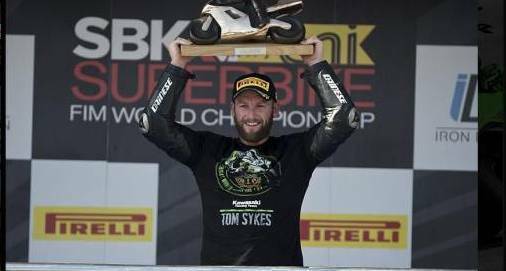 Sykes is now only the fourth Briton to ever win the WSBK title, after Carl Fogarty, Neil Hodgson and James Toseland.